Bowling balls, that is. Oh. My. God. Let me explain. 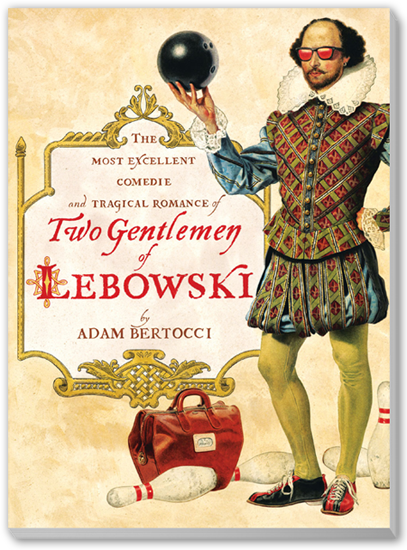 What if… William Shakespeare wrote The Big Lebowski? Why would anyone ask themselves this question? No one is sure, including writer Adam Bertocci who wrote The Two Gentlemen of Lebowski in an inspired frenzy in late 2009 and saw it play on stage in New York City the following spring. I just finished reading it, and wowzas, it’s a bit funny. It’s an adaptation of the Coen Brothers’ 1998 film The Big Lebowski. If you don’t remember the story line, take a gander at the Wikipedia article. It’s an odd movie… the unemployed, laid-back, pot-smoking Dude (Jeff Bridges) and his Vietnam vet bowling buddy Walter (John Goodman) are embroiled in goofy hijinks involving a rug, mistaken identity, a pseudo-kidnapping, missing ransom money, spiked White Russians, misplaced toes, ears, urine, and ashes, and well, throw in a bunch of F-bombs, and I think I’ve set the stage. Remember, it’s the Coen Brothers. So, Bertocci took this and said “let’s make it Shakespearean.” He rewrote the entire story in Shakespeare-like heightened language, even throwing in Shakespearean references (he claims there are references to all the plays, sonnets, and other works and I believe him!). Bertocci follows the film’s plot closely and even works in the lyrics to some of the songs used in the film. It somehow works. I can’t really convey how funny it is. It had me laughing out loud several times, and smiling with amusement most of the rest (it’s a really quick read if you are familiar with the movie… I just watched it on Netflix last week, so the story was fresh in my mind). It is almost too difficult to pick out a few examples, as the whole thing is so hilarious and I feel like the examples will sound dumb out of context. Well, here is one. You may recall my love for Balthasar’s song in Much Ado About Nothing. I started many of my posts with it and used it as my theme. And ever preserve me as thine, blithe and Bonnie. constantly is the service of a tongue most moved in capability. Look to my foot; I cannot reach that far. Blow, wind! Ways are known, Knave. Thou wilt not like to hear. Ere singeth cockerel at three o’clock. These amateurs would have us soil’d with fear. I really wish I could see a video of it in performance, but alas, the Coen Brothers have apparently put the kibosh on future productions. There are two short videos that are worth watching on the DMTheatrics’ American Shakespeare Factory archives. I can imagine with music and dancing, it would be a really fun show to see.